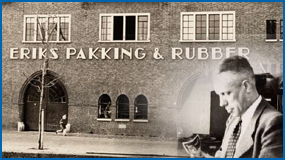 As the son of the director of a dairy factory, Arie Eriks saw the need for maintenance products in process systems and established ERIKS Pakking en Rubber in Alkmaar in 1940. Since its foundation, ERIKS has supplied the process industry with seals, rubber hoses, moulded rubber parts, and later valves and power transmission. The expertise ERIKS was developing could also be applied to other process industries (chemicals, oil and gas, energy, food), but also to the provision of advice on and the supply of products for machine and equipment construction. ERIKS developed its market position in the Netherlands, and opened its first branch in Belgium in 1956. During the 1960s and 1970s ERIKS continued to develop its core activities of sealing technology, flow technology and power transmission in the Netherlands and Belgium with great success. It also made its first foray into industrial plastics. With its already extensive and high quality product range, it started to approach industrial end-users (maintenance and OEM) directly. In 1977, ERIKS applied for stock exchange listing, and ERIKS shares were traded on the Amsterdam Stock Exchange. ERIKS continue to expand during the 1970s and 1980s. Following its industrial customers, branches were opened in Singapore (1979) and Malaysia (1980), and the first branch in France opened for business in 1977. 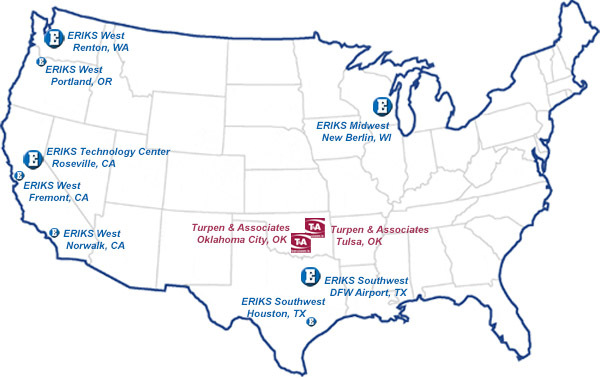 ERIKS' growth really began to take shape in the mid-1980s with a series of acquisitions. In addition to acquisitions in the Netherlands and Belgium to boost its market position, ERIKS acquired its first specialist distributor of sealing technology in North America in 1988. More acquisitions were to follow. ERIKS' first foray into the German market came in 1994. The acquisition of Heusinger + Salmon in 1997 gave ERIKS a prominent position in the German market. This was subsequently expanded upon with further acquisitions. In the late 1990s, ERIKS developed a new strategy based on a new business model (the twin business model). To achieve this, major acquisitions were made in the Netherlands and Belgium. The acquisition of Wyko in 2006 gave ERIKS a prominent position in the British market. All this, along with the acquisition of some other specialist distributors, laid the foundation for the development of the twin business model and the growth of ERIKS in the UK. The acquisition of Passerotti in 2006 was ERIKS' first step into the Polish market. In 2008, ERIKS acquired Econosto. Together ERIKS and Econosto were able to significantly boost their market position in the core activity of flow technology in the Netherlands, Belgium, Germany, the United Kingdom and South-East Asia. ERIKS also acquired branches in Spain and the Middle East. ERIKS was acquired by SHV Holdings N.V. in 2009 and was delisted from Euronext Amsterdam. Going forward, ERIKS intends to continue to develop as an independent group within the SHV group.